1. Making homemade jam. I made blackberry jam last weekend (pictured above). I love to give these away in baskets for Christmas gifts. I hope to be making peach jam soon. 3. The way my skin looks and feels when I use this product. Read the reviews and you'll see how great it is. I also found great reviews that weren't on the manufactures web site. You have to give it a least two weeks to see the results. It can be bought at Walgreens, Rite Aid, etc. 4. Listening to this guy...he can change a bad mood into a happy one with just his voice. This is a proven fact because it actually happened to me today! Go to his website and send him an E-flirt (I'm too shy to do this). 5. The best chocolate in the world. I'm sure some people would disagree but it's my favorite. Love their butterscotch squares! 6. Santa Rosa plums....my absolute favorite fruit and it's only available for 2 weeks in mid June. I wish I had room to plant one of these trees. They are the best! What fun happy things you've listed. Your jam looks awesome and I'm sure it is delicious. Will have to check out that chocolate! Yummm . . .
Love Michael, love sipping iced tea. I will have to make a list sometime too. I have never tried making jam. I should try it sometime. Love your "happy things." And I like your new banner. How long has it been up there? It looks great! What a great list. 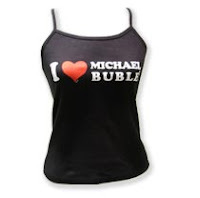 I love Michael Buble too. The jam looks so yummy. Thanks for the tip on the skin product, I've been looking for something just like it! Cindy, those are really good "happy things". I totally agree on the Sees Candies...it's awesome. And homemade jam...yum. My mom makes it, but I don't. I love the pig holding the blackboard! i love your happy things list..i will have to try the skin care...i need something new..
Love Michael Buble. I think that is half the reason I like the movie The Wedding Date with Debra Messing. Being that I am from the Midwest and have spent a considerable amount of time in California, I have to disagree regarding Sees. I like Fannie May. My best friend is a die hard Californian, lives in the San Fernando Valley and she would agree with you. I love your "Happy Things" idea!! Your list made me smile. Oh and I love your plates in your gorgeous bedroom! I was just given boxes of old mismatched plates and appreciate the inspiration Cindy! My favorite chocolate is Godivas "Key Lime" truffles... rich dark chocolate with a creamy *tart* filling. Yummy! Hi Cindy. I am sitting here at work having a cup of your fav tea. How yummy!! I picked up a box today at Whole Foods. Thanks for another great find! 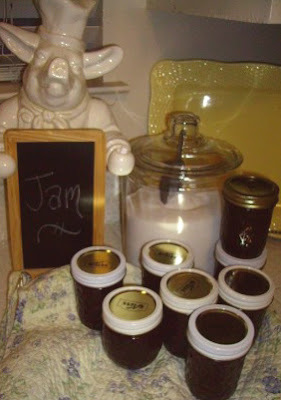 Cindy, I'm always in awe of anyone that makes jam from scratch. It seems like such an involved process. I love receiving homemade jam, there's nothing that can compare. That was a fun list! Such a fun, uplifting idea to post about happy things!! Cindy, I'm worried about you. Are you ok?